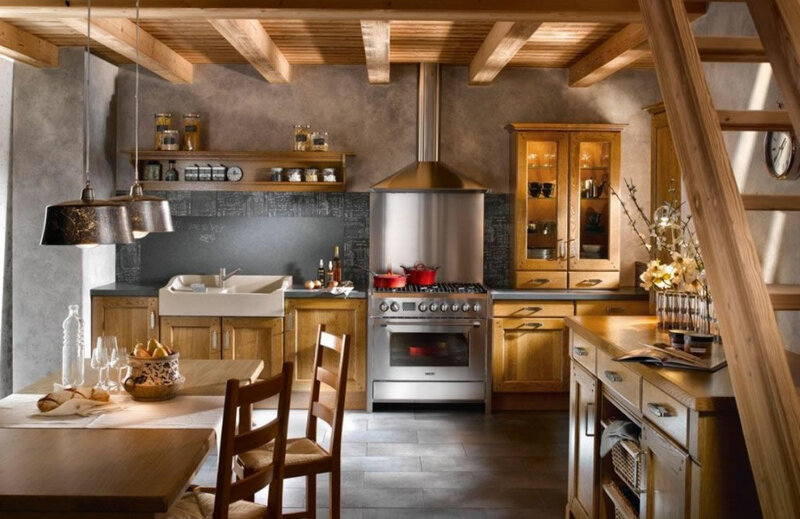 Unlike modern kitchen which are dominated by smooth and straight lines and glossy surfaces, rustic design kitchens are known for their extensive usage of natural materials: brick, wood, ceramics, and rock. 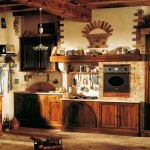 Due to those materials these kitchens have predominantly curved and softer lines. 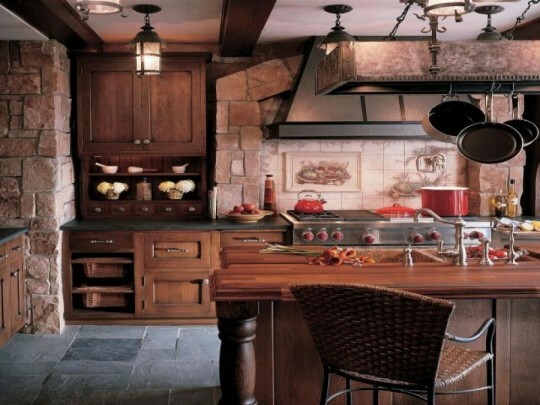 Thanks to the minimalist appearance and large amount of drawers and cabinets to hold every single kitchen item, modern kitchens often look like they’re never even being used. 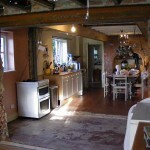 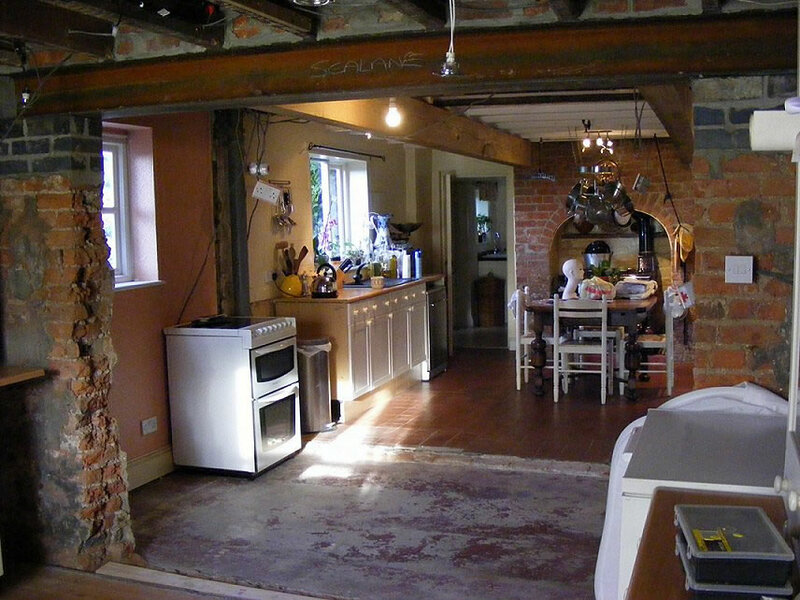 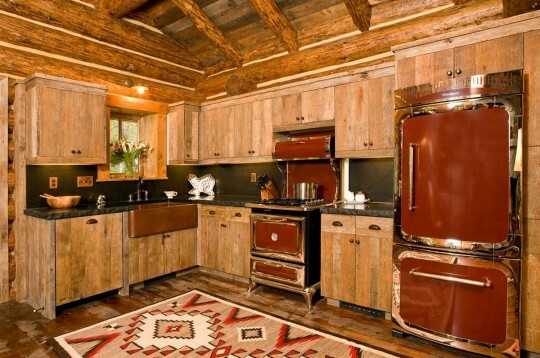 Old rustic kitchen is exactly the opposite. 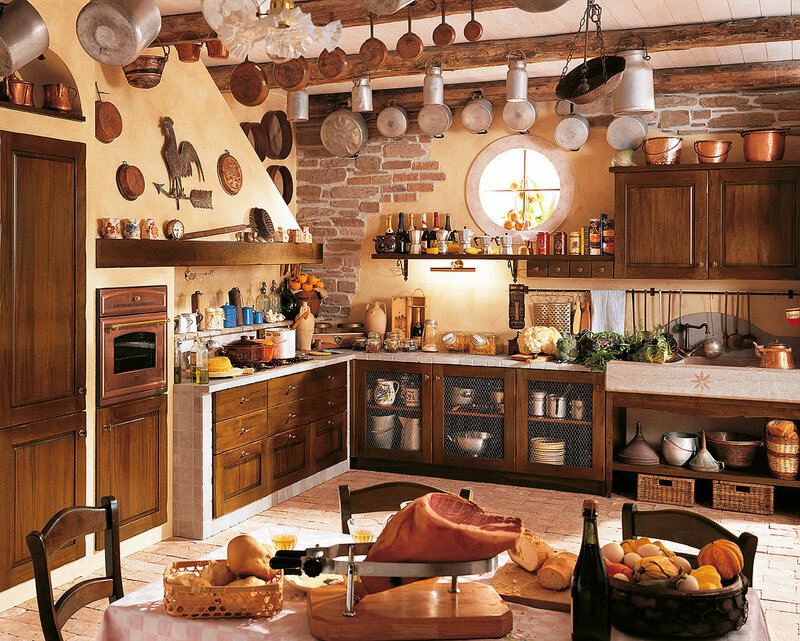 It’s typically filled with open shelves with glasses and mugs, hangers for kitchen accessories and frying pans, dressers with transparent glass doors showing the dishes, and many other details. 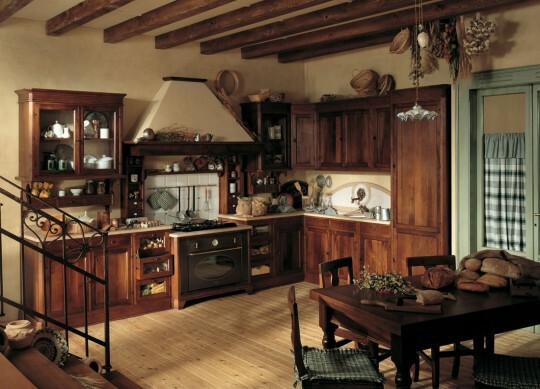 All that gives rustic kitchens an irresistible charm, and nostalgically remind us of warm gathering places of previous generations where entire families would dine and hang out. 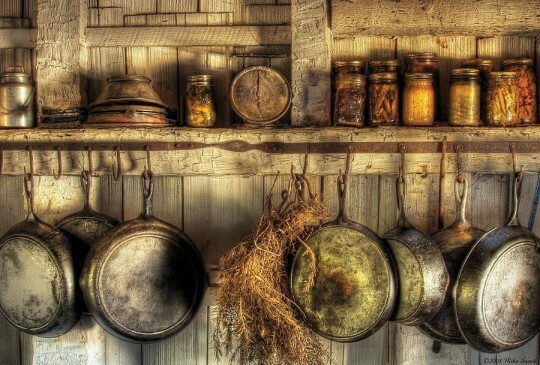 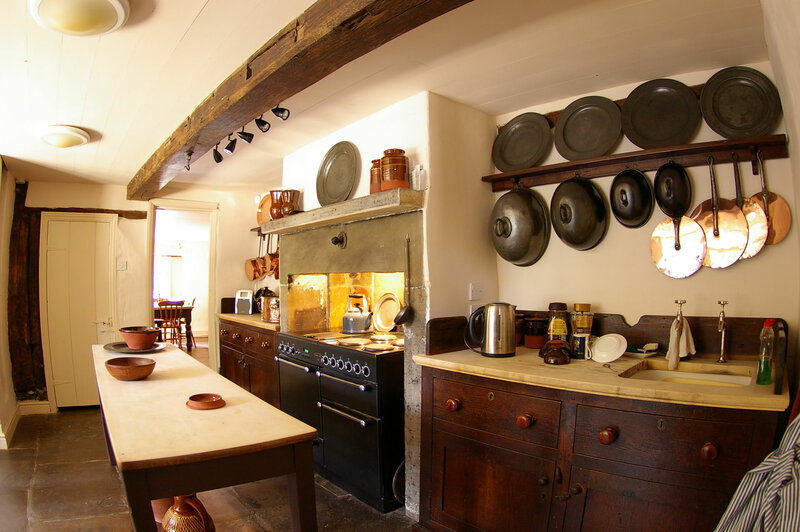 Displaying various spices and frying pans is a great way to add style to your rustic kitchen. 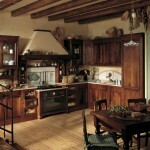 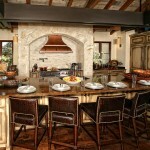 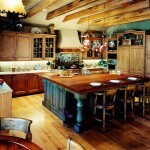 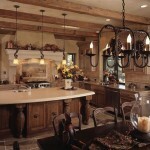 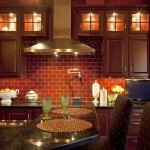 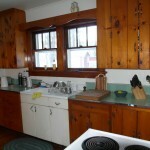 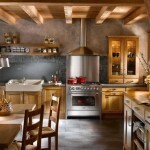 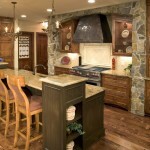 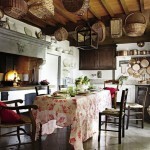 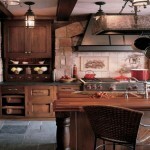 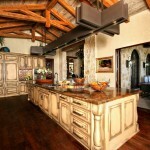 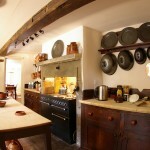 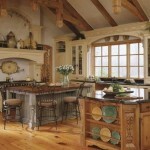 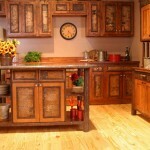 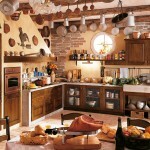 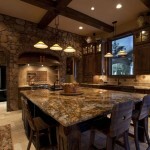 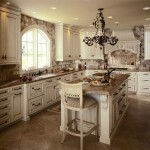 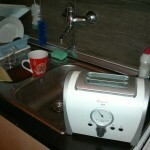 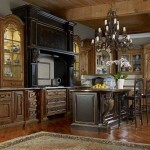 Since it’s mostly made from hard wood with a lot of handwork involved, rustic kitchen belongs in a higher price range. 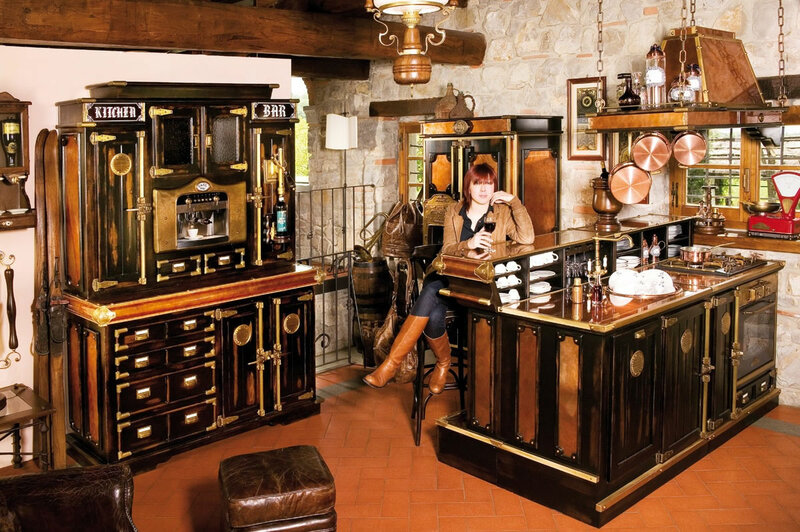 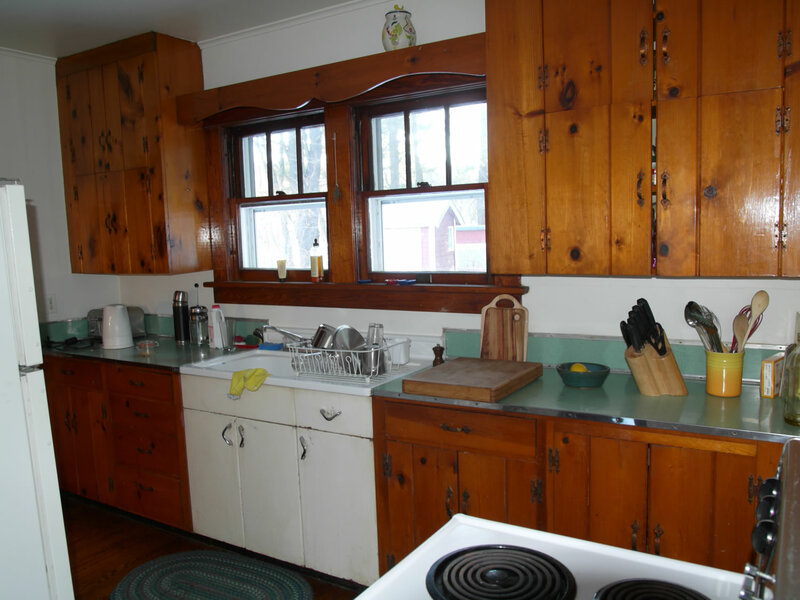 But the lack of money doesn’t have to be a hurdle if you desire an old fashioned classic kitchen. 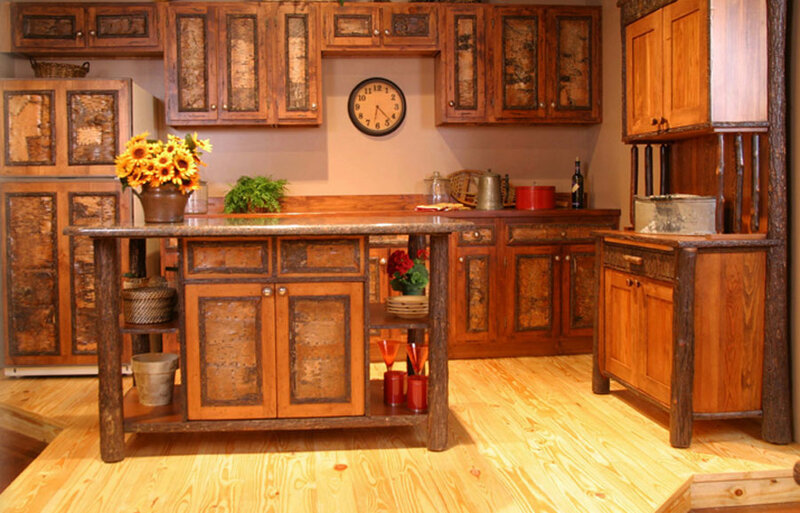 Some parts you can even make by yourself or with the help of friends, and certain pieces of furniture can be bought dirt cheap on yard sales, pawn shops, restaurateur shops, or even yellow pages, or online sites like eBay and Craigslist. 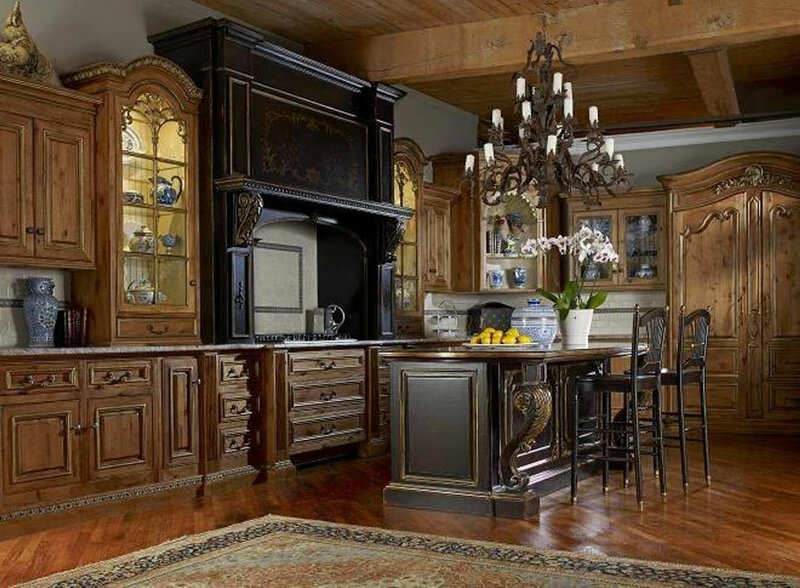 You can often find very affordable old fashioned hanging cabinets with glass doors, wooden shelves, wood chairs or benches, which will give your rustic kitchen some much needed charm and style. 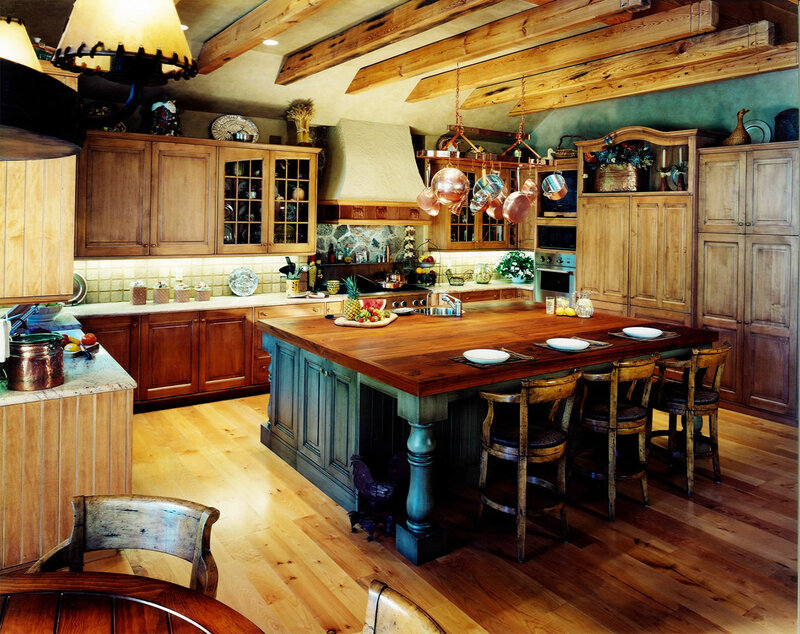 Keep in mind that your entire kitchen doesn’t necessarily have to be old fashioned: a combination of rustic and modern designs can also look beautiful, and there’s plenty of inspiration to draw ideas from. 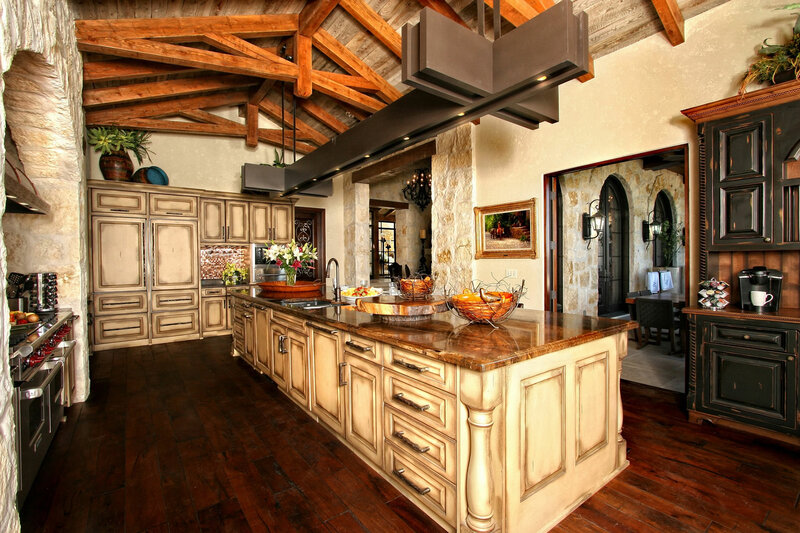 Wood planks on the ceiling or vertically next to a bar or support pillars can look great even in a contemporary kitchen with straight lines, which has mostly wood and metal elements. 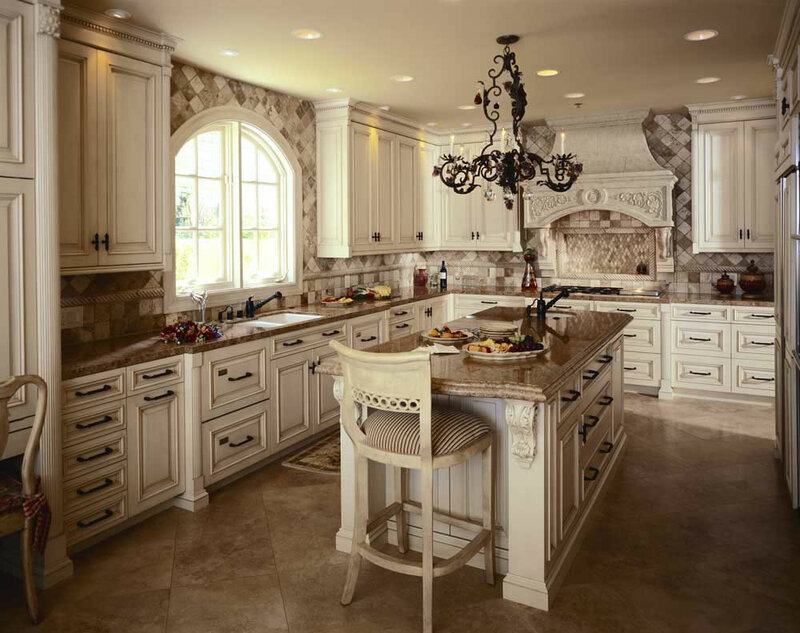 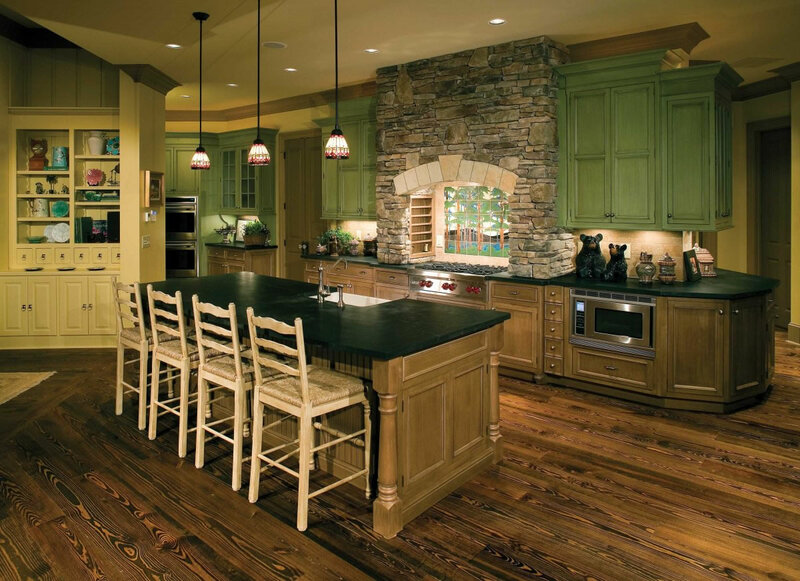 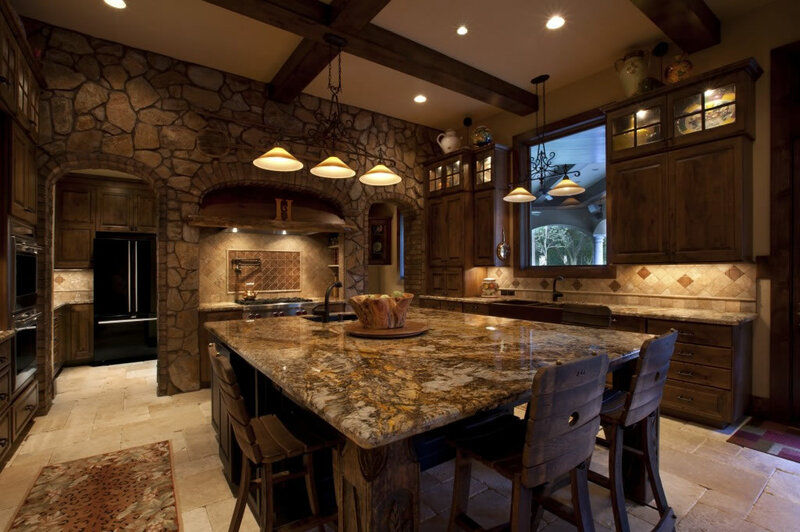 Besides wood, rustic kitchens have more natural materials such as ceramic tiles, which are often on the work space or kitchen island as well as the floor and parts of the walls. 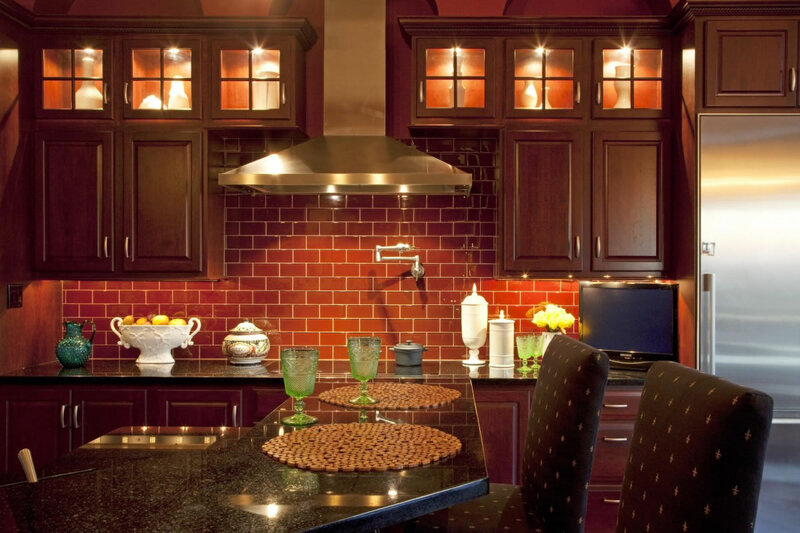 If possible, you can also make a part of a wall without any wood or tiles to show bricks if possible, or achieve a similar effect by using tiles which imitate brick or stone. 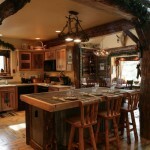 Something that doesn’t truly fit in your rustic kitchen is definitely a steel sink. 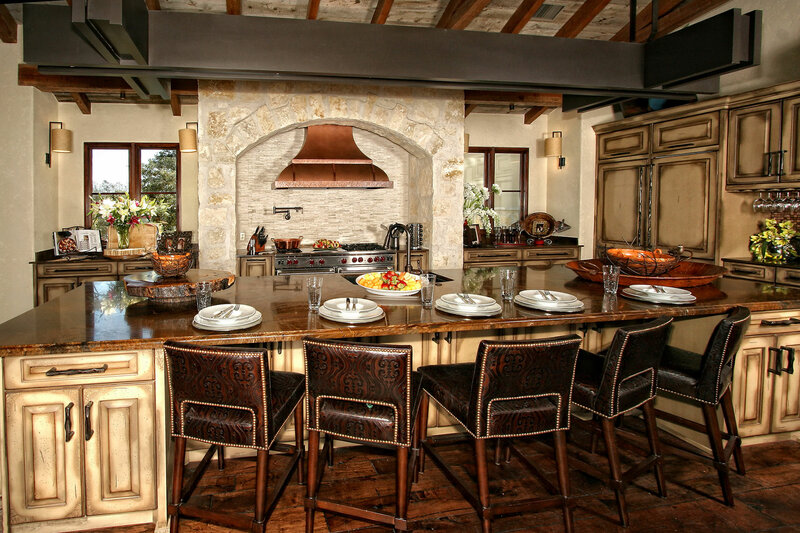 A long time ago large stone sinks were used, but many manufacturers now make ceramic sinks which will fit much better in your rustic design. 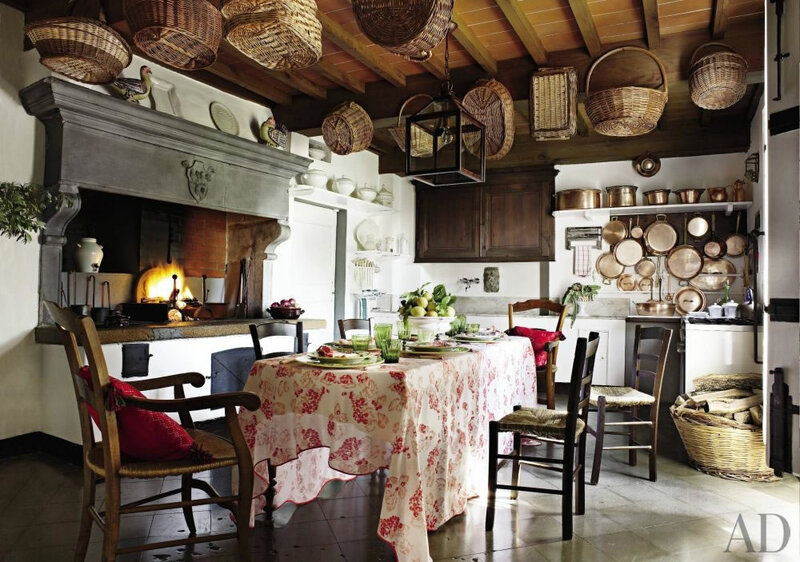 Your cabinets don’t necessarily need to have wooden doors either, and instead you can use small curtains with flower motifs for example. 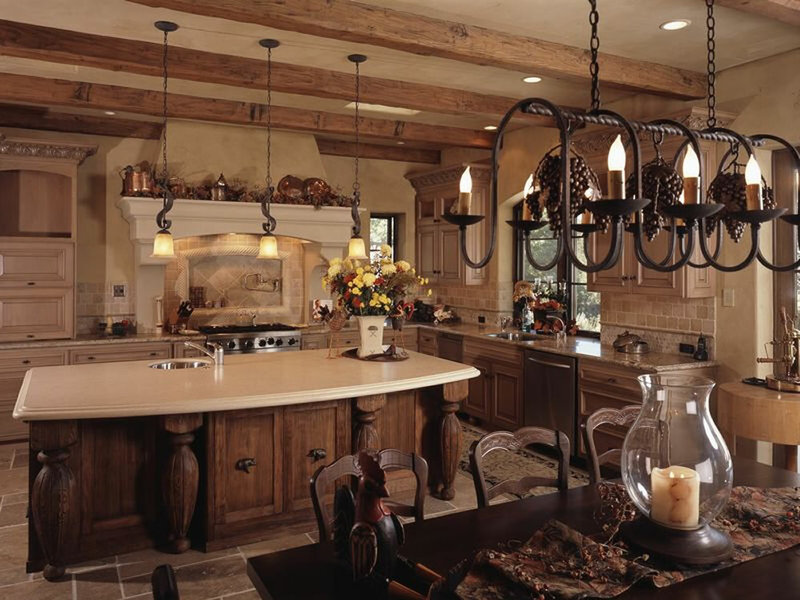 Also, if you have additional space be sure to build a bar or a kitchen island, which can also connect your kitchen to your dining room or living room. 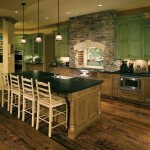 For materials it’s best to use hard wood or brick. 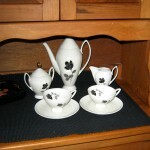 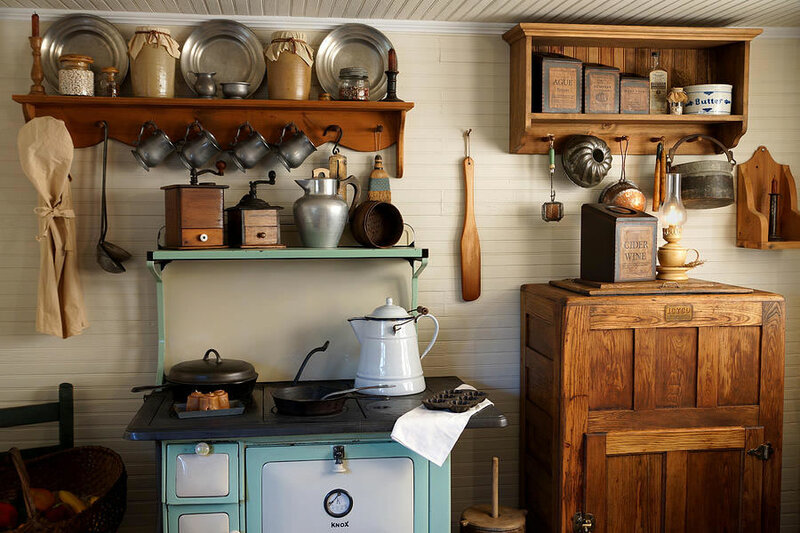 An important detail you absolutely should have in your rustic kitchen is a vintage tea set. 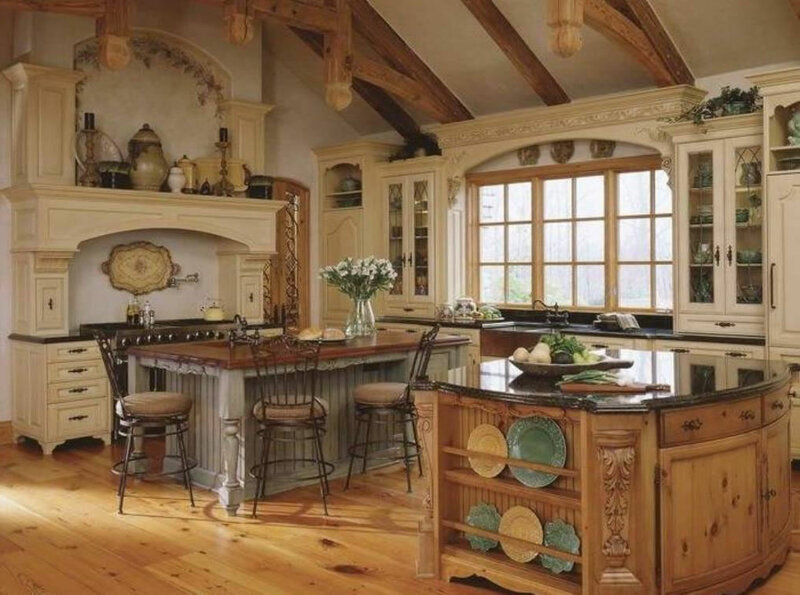 Vintage tea cups with floral or some other romantic motifs are the perfect touch in rustic kitchen design, and it’s almost unimaginable building your kitchen without having one. 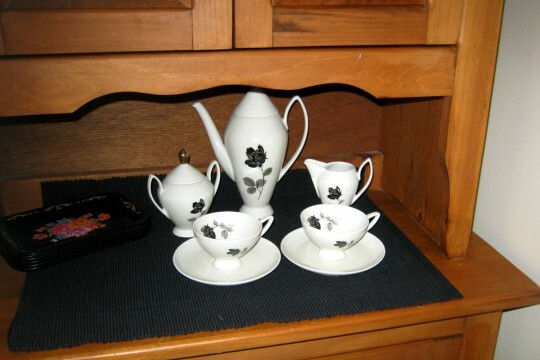 Be sure to display your tea set in a glass cabinet or a shelf to be seen, as these old fashioned dishes don’t just have a practical, but also a decorative function. If you don’t have the inspiration or the time to build your own rustic kitchen, there are many manufacturers today which can provide fully furnished kitchens in this ever-popular style. 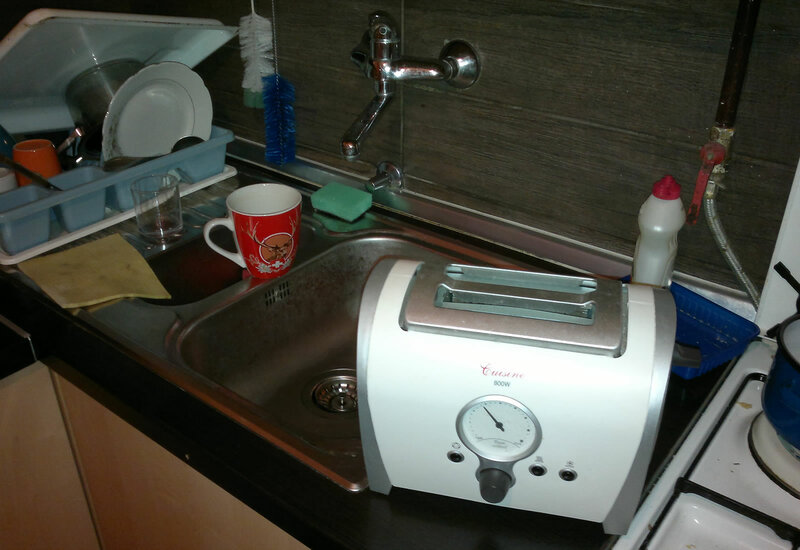 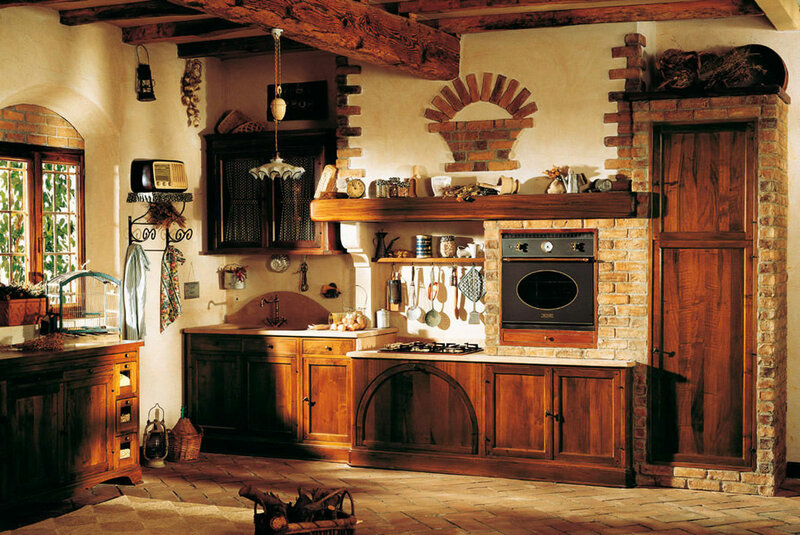 You can even get various kitchen appliances like microwave ovens or toasters in retro designs, all of which will fit much better in your rustic kitchen than contemporary, straight-lined appliances. 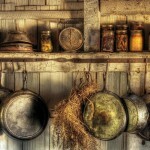 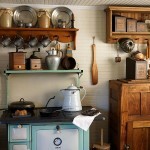 Vintage kitchen appliances look amazing in rustic designs. 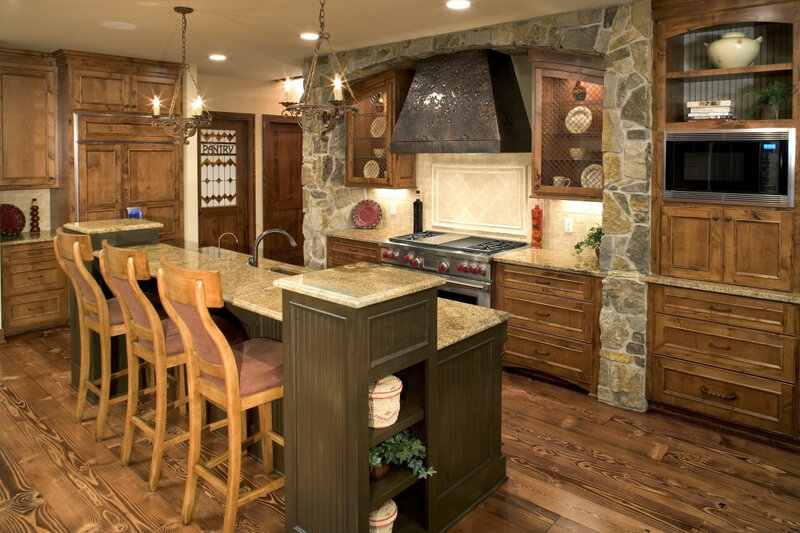 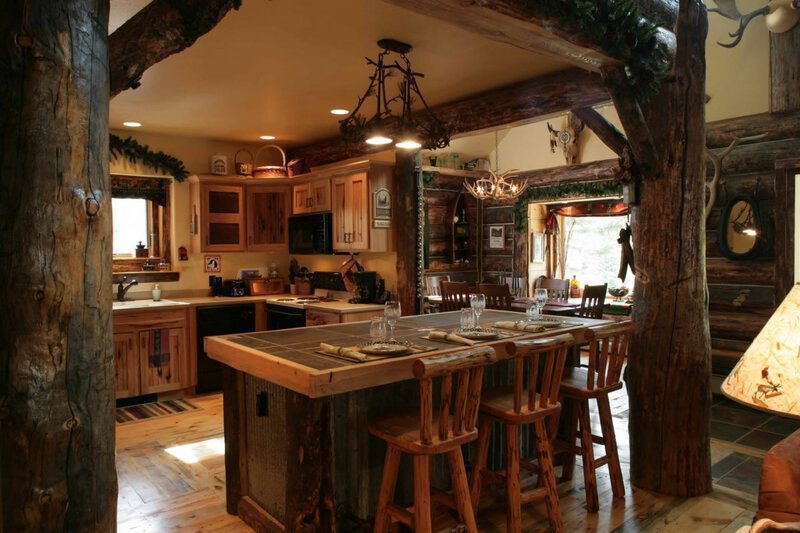 If you have your own rustic kitchen design ideas be sure to share them with us! 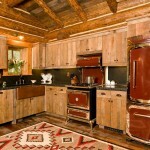 Also, don’t forget to browse our entire image gallery below for many more amazing rustic design ideas.